A reverse mortgage, or HECM (Home Equity Conversion Mortgage), is the best way to turn your home’s equity into tax-free cash without having to make any monthly mortgage payments. 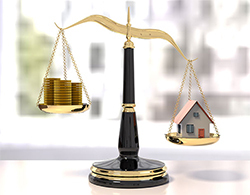 While the borrower is living in the home, the loan requires that the borrower continues to pay property taxes and insurance, as well as maintaining the home, along with complying with all terms of the loan. How does that help me purchase a new home? In 2008, FHA (Federal Housing Administration) created HECM for a Purchase loan. It was designed to help senior homebuyers purchase a new primary residence using a reverse mortgage while all within a single transaction. How much could I qualify for? The loan amount is based off the age of the youngest borrower, best interest rates, and the value of the home that you are looking to purchase. One borrower must be 62 years of age or older. The new home you want to purchase must be your primary residence. You must have a sufficient down payment to purchase the home. The new home must meet FHA guidelines. What are the benefits of a HECM loan? There are NO monthly mortgage payments. You can sell your home whenever you would like to. You’re allowed to remain on the title and continue to own the home. Senior homeowners look for a house that is smaller, without stairs, closer to family and friends, and in a warmer climate. A reverse mortgage loan is the best and easiest way to plan for your financial future. Buy with a Reverse Mortgage: In 2008, Congress authorized a Reverse Mortgage for Purchase program. Seniors using this program can purchase a home without ever having to make a monthly mortgage payment. Buy with All-Cash, Then Do a Reverse Mortgage: The easiest way to buy your home is by paying all cash. Then, once you take out a loan, you can replace assets that were liquidated to purchase the house. There are many advantages to paying all cash rather than using the reverse mortgage to purchase your home. If you want to have the new house constructed to your liking, you can’t finance the construction with a reverse mortgage. However, many seniors do not have the free cash required to pay all cash, and tapping retirement accounts is resisted, for good reasons.